This clothes RUNS SMALL A LITTLE,choose a little bigger size or take each measurement a bit loosely will be more comfortale for your pet. 3.Measure the broadest part of the chest (Girth) all the way around (usually just behind the front legs). Application: Dress it up as a joyful adorable shark at a party, great idea for any festival like Thanksgiving Day, Easter Day, Halloween, Christmas, Birthdays, Weddings, Parades, Photo Shoot ,Weekend Parties or Daliy Wear.Get your pet involved in the joy you have at the festival. Service:We aim to bring prime quality as well as fancy products and pet supplies or accessories at cheap rates that are certainly better than other brand. Size M: 11.0" neck girth; 15.7" chest girth; 10.6" Back Length,Recommend for 5.0 to 8.5 lbs,Please measure your loved dog's neck girth,body(back) length,chest girth before placing the order,This clothes runs small a little. PLEASE pay attention to the size before payment!!Thanks!! Suitable for Winter or Autumn.Keeps your pet warm and cozy throughout any outdoor activity. Assured to bring smiles to the faces of your loved ones with loads of love for your pet. Outer material: velvet ; inner material: microfiber, keep your dog feel comfortable all the day. 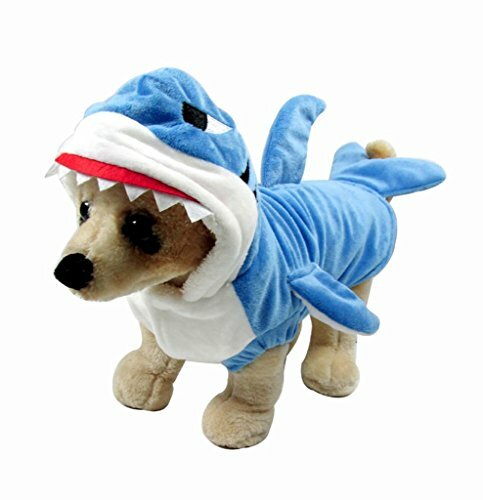 Feature: Cat/Dog pet adorable SHARK costume hoodies,let your pet join the fun in a costume, get your pet involved in the entertainment you have at the festival. If you have any questions about this product by Mogoko, contact us by completing and submitting the form below. If you are looking for a specif part number, please include it with your message.